With an extremely wide range of configurations and optional features, Sécheron UR-type DC HSCBs ensure the electrical safety of the equipment powering the overhead lines and third rails of DC mass transit (metro, Light Rail Vehicles, tramways, EMU trains) and DC railway systems. Our solutions are compliant with IEEE standards. Sécheron is the railway industry’s global partner for electrical safety solutions for DC traction power substations, bringing decades of experience serving the rail industry. Traction power substation manufacturers and operators have come to rely on our experts for personalized support throughout all phases of their DC traction power substation projects, from recommending the most appropriate solution to obtaining local after-sales service worldwide throughout the lifetime of their products. 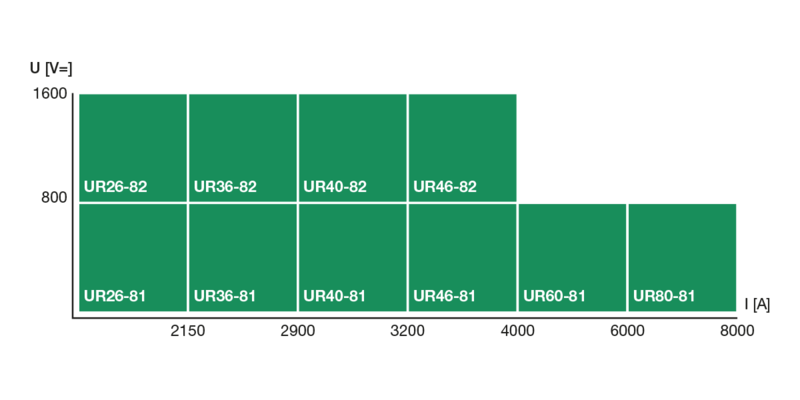 Our UR-type DC HSCBs come in a wide range of configurations to suit virtually all operational requirements and can be integrated into DC switchgear or metal-clad enclosures configured for line feeder panels, rectifier breaker panels, and interconnecting breaker panels, for example. Rated Voltage 800 VDC, 1600 VDC. Current range from 2000 A to 8000 A. Control voltage 110 VDC or 125VDC. High insulation level – OV4. Ambient temperature – 25 °C to +40 °C. Reference standards: ANSI C37.16; ANSI C37.14.